This is one of those inventions most of the world really would probably wish it was never created. To be more specific everyone around the person that owns one of these will really really wish that it would just break. It can be reused time and time again, you’ll never need a refill for it like you would a normal air horn. Which means misery for all those around the person that owns it, up until they wise up and “accidentally” smash it. The horn blares just as loud as all air horns. In order to keep it going you refill it with the included pump or any bicycle pump or service station air pump. Each time you recharge it or fill it up using a pump it will get you 70 excessively loud blasts. The fun will just keep on coming. Not only is it meant for sports fans or those that just enjoy annoying others but for boaters as well. 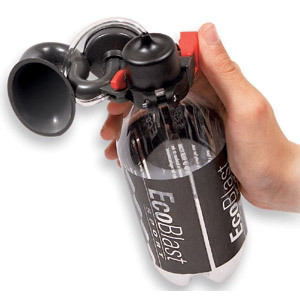 You can purchase the Ecoblaster Rechargeable Air Horn for $29.98 from Things You Never Knew Existed. Is it available in south africa?